In 2015, Tencent founded Penguin Pictures to ramp up original programming. This year, the social media and gaming giant is expected to produce eight times (in Chinese) as much original video content as it did in 2016, Sun Zhonghuai, CEO of Penguin Pictures said recently at an industry conference. Youku and Tudou, which merged in 2012 and were acquired by Alibaba in April 2016, have laid out steps to seize full control of production and broadcasting. Across the cyberspace, the number of premium TV dramas rose from 36 in 2015 to 239 in 2016 (in Chinese) according to EntGroup, a third-party research company focusing on media. Both Tencent Video and iQIYI produced over 30 premium dramas last year, surpassing Netflix which posted 29. 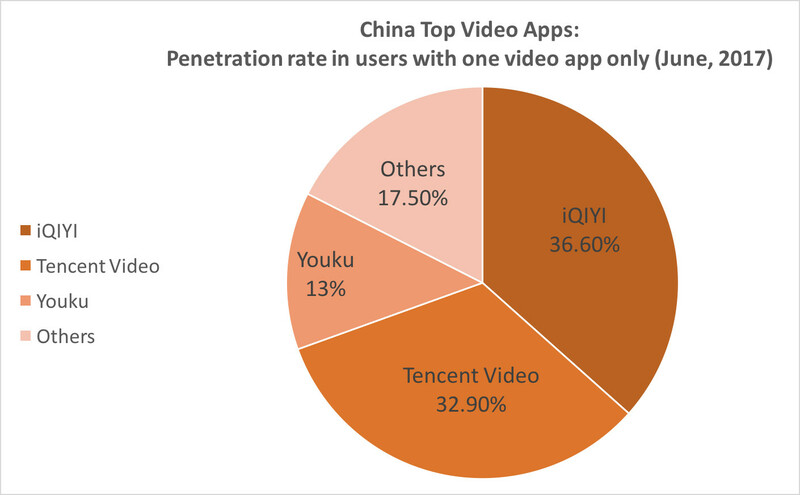 Together the three giants attract over 80% of Chinese consumers who use only one mobile video app (many have more than one), based on QuestMobile data (in Chinese) from June. Tencent Video and iQIYI are competing neck-and-neck. While iQIYI leads with 36.6% penetration rate among users with one video app, Tencent Video claims 104 million mobile daily active users (DAU), compared to iQIYI’s 78 million, for the first six months of 2017, says data company JPush (in Chinese). Youku trailed behind at 36 million DAU. By bringing production in-house, nonetheless, internet companies gain control over how the content is made and used. For example, shows and series—including those produced by TV networks—now come in fewer episodes and are released over a longer cycle. In doing so producers can leverage viewer data to fine tune the upcoming narrative and elongate the buzz. Because content is now exclusive, streaming platforms can charge users for value-added services like an exclusive premiere or ad-free experience. And it’s getting ever easier to lure video users to pay, thanks to their growing respect for copyright and the advance of mobile payment. EntGroup estimates that paying video subscribers in China will hit 100 million by this year. “Any online video sites who want to purchase a top reality show from a top TV station needs at least 100 million RMB in their pocket, and this 100 million RMB only gets you through three months. But if I use that same amount of money to make The Rap of China, it becomes our own IP!” Chen Wei said in an interview with local media. Indeed, “IP” has become a new buzzword for China’s content providers: its industry value surged from 295 billion RMB in 2014 to 562 billion in 2016, according to Creation Venture Partners, a Shenzhen based venture firm with a focus on media and entertainment. Censors have, however, already tightened the grip on digital content as online viewership expands. By this June 75.2% of Chinese netizens were watching videos online. The highly anticipated internet reality show Who’s the Murderer (明星大侦探) was called off by regulators after broadcasting two episodes in September. Upping the ante in original content seems, at least in the long term, a more financially viable move. iQIYI has already had some success with The Rap of China. The show is around the break-even mark, a source that prefers to remain anonymous told TechNode, with most of the revenue coming from big advertisers wooing the show’s young audience. Shortly after The Rap of China proved its success, Tencent Video announced hitting 43 million paid subscribers in late September, topping the rank of Chinese online video platforms, the giant claims. Sun Zhonghuai hailed quality, rather than quantity, as the competitive advantage in this stage of the video arm race. Indeed, Chinese video giants often speak of Disney as the Holy Grail: Make money by being an intellectual property generator above all else.